Located in Decatur, Greenwood Cemetery is rumored to be one of the most haunted locations in central Illinois. One of the most interesting stories at Greenwood concerns the so-called “Greenwood Bride,” who wanders the grounds in her wedding dress searching for her fiancé, who was murdered by bootleggers. The story begins during the era of Prohibition, when many who were down and out sought to make their living in the lucrative but illicit alcohol trade. One young Decatur man was a whiskey runner with a beautiful fiancé. One evening, the young man and his bride-to-be decided to elope, but he wanted to make one last whiskey run before the wedding. Unfortunately, some of his business rivals caught up with him and murdered him, leaving his body in the Sangamon River. When his fiancé found out, she was so grief-stricken that she drowned herself in the same spot in the river. Her parents buried her in Greenwood Cemetery in her wedding dress. 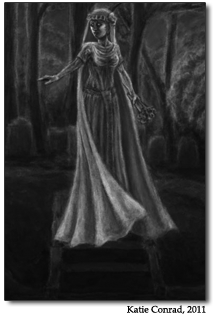 She now floats among the tombstones, wiping tears from her angelic face. There are several vanishing hitchhikers in Illinois, but few are as alluring as the “flapper” ghost of North Riverside’s Melody Mill Ballroom and Jewish Waldheim Cemetery. Like Archer Avenue’s Resurrection Mary, this young woman died in the 1920s or the early ‘30s, and her ghost dances the night away with strangers, only to vanish during the ride home. Unlike Mary, however, Melody Mill’s “Flapper Ghost” is much more vibrant and colorful, and is described as having brunette, “bobbed” hair. According to author Jo-Anne Christensen, she “wears a gaily colored sheath and shows plenty of shapely leg.” Melody Mill Ballroom was eventually demolished, but sightings of the flapper continued into the ‘90s. Bachelor’s Grove has been a south side enigma for over three decades and is one of the most famous haunted cemeteries in America. It is said to be home to many phantoms, including strange lights, a two-headed monster, and a vanishing house. Another popular ghost is the White Lady (or Madonna) of Bachelor’s Grove, who is said to be seen cradling her infant son. This ghost, or one very much like it, was supposedly captured on a now famous photograph taken using infrared film. 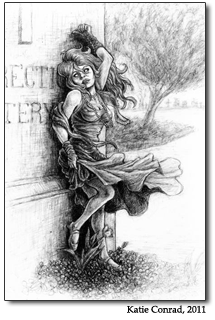 Forlorn and enigmatic, she sits on a fallen headstone, her flowing, ivory gown teased by the passing breeze. In an area first settled by bachelors, it is no wonder that such a phantom appears there time and time again, desperate to be reunited with a lost love. Built in 1869 by Henry Guest McPike and designed in the Italianate-Victorian style, the McPike Mansion has long captured the imaginations of Alton residents. Although it was added to the National Register of Historic Places in 1980, it has sat abandoned for decades—attracting vandals and the curious alike. There are two known entities here. The mansion’s new owners named one of them Sarah, because, according to Troy Taylor, an old book found in the mansion had been inscribed with the name “Sarah Wells.” Sarah is thought to have been a hired hand in life, and teases visitors with a spectral touch or hug. She also makes her presence known with a hint of lilac perfume. During the late 1800s, Okawville was widely known for its mineral springs, which were believed to have an invigorating effect on a man’s vitality. After this particular quality of the springs was discovered in 1867, a local businessman and a farmer established the first bathhouse and spa at the location. That burnt down in 1891, and the current building, which became the Original Springs Hotel, opened in the spring of 1893. The hotel is still in operation today. Guests at the hotel have reported seeing a mysterious woman wearing a white dress in the fashion of the early 1900s sitting on the second floor balcony. Her face is always hidden beneath her hat. This voyeuristic phantom is certainly not shy. One guest reported seeing her standing near his bed, and another saw her staring out the window of a locked storage room in the men’s bathhouse. Eastern Illinois University’s Pemberton Hall is the oldest all-female dormitory in the state of Illinois, and its ivy covered walls and old-English look and feel was well suited for its first full time matron, Mary Hawkins. Mary emigrated from Great Britain in 1901 and assumed the position of dorm director of Pemberton Hall in August 1910, when she was 33 years old. Sometime after her death, the girls of Pemberton began to believe her ghost returned to haunt the hall. 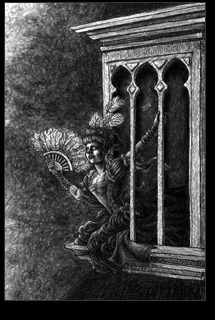 The Roommate’s Death, a common folklore motif in which a student is murdered by a crazed janitor, has merged with the story of Mary Hawkins to create a unique tale. 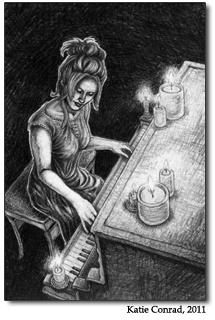 Sometimes Mary manifests herself as a prankster; a young woman who scratches at doors, leaves bloody footprints, or wanders up to the fourth floor to play the piano dressed in nothing but a thin white gown. Other times, Mary has been flirtatious. One former resident director claimed that her fiancé felt an invisible hand smack him on the behind! Opening night at the Drake Hotel was both magnificent and tragic. It was magnificent because the Drake was to be one of Chicago’s most beautiful hotels; it was tragic because it was the night the “Woman in Red” ended her life. According to legend, on New Year’s Eve in 1920, a wealthy venture capitalist and his fiancé attended the gala held in the Drake’s Gold Coast Room on opening night. The man stepped away and did not return, so his fiancé went looking for him. She found him, enthralled by another woman, in the Palm Court parlor. Devastated, the Woman in Red climbed to the roof and jumped to her death. Since then, guests at the Drake have reported seeing her ghost in the Gold Coast Room, Palm Court, and on the top floor and the roof. She is called the “Woman in Red” because of the gleaming, crimson silk gown she wears, which compliments her long black hair and emerald eyes. Between mid-December 1980 and early January 1981, dozens of people reported seeing a young woman in various stages of dress walking down Kennedy Hill Road outside of Byron. Despite the icy wind and cold, she was sometimes wearing attire more suitable for the beach, and was said to be very athletic and slender, at one point leaping over a nearby fence with ease. By January 20, 1981, the sightings had reached a fevered pitch. Motorists parked their cars in the frigid temperatures along the narrow rural road to catch a glimpse of what became known as “The Phantom Lady of Kennedy Hill Road.” It was said that the scantily-clad phantom was searching for her lost grave, which had been plowed over by a nearby farmer. Newspaper reports reached as far away as Chicago, and the Rockford Register Star ran five consecutive articles on the sightings. The phantom lady disappeared after the snow thawed that spring and was never seen again. Every year, thousands of motorists drive past the gates of Resurrection Cemetery, hoping to catch a glimpse of a girl named Mary and offer her a ride. Resurrection Mary, as she is known, is hands down the most famous legend in the Chicagoland area. 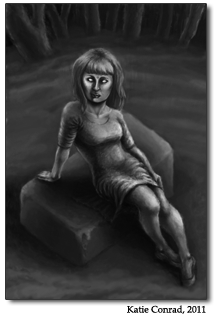 She is the subject of a novel, several songs, two films, and is an indispensable part of any book on Chicago hauntings. Folklorists and ghost enthusiasts alike claim that Mary’s story dates back to the 1930s, when the ghost of a burgeoning Polish girl was first seen along Archer Avenue near Resurrection Cemetery. She dances with unsuspecting men at the Willow Brook Ballroom and then asks for a ride home, only to vanish before reaching her destination. Authors Michael Norman and Beth Scott describe her as a “captivating, blue-eyed, flaxen-haired girl in her late teens” who wears a “long, off-white ballgown and dancing shoes.” Rachel Brooks romantically portrays Mary as “an innocent young woman… stranded and alone.” She is “soaked to the bone… with beautiful blonde hair and sparkling blue eyes.” Always virginal, yet slightly dangerous, Resurrection Mary remains one of the most beloved specters of Chicagoland.